Preferences related to the printing of invoices appear in this window, allowing users to customise the printing of customer invoices. Check this option if you don't want placeholder lines to appear on your printed invoices. 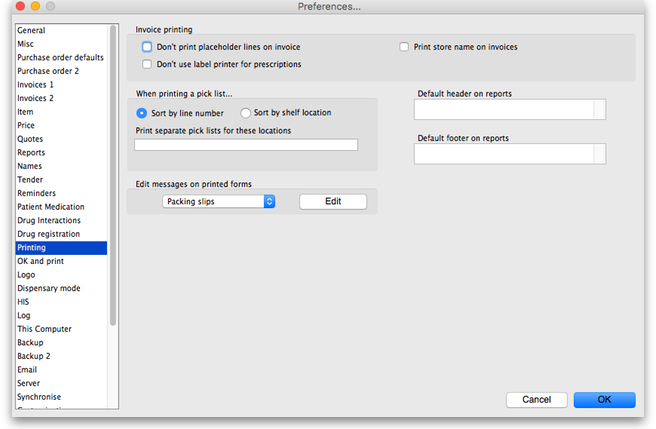 Check this option if you want to use a normal printer (not a label printer) to print prescriptions. You can also set a priority for shelf locations, and this will override the default alphabetical ordering i.e. locations with a priority of 1 will come first (in alphabetical order), then those with a priority of 2 etc., with priority 0 locations at the end. See Locations and location types for more details. By default mSupply will print a single pick list for all locations. If, for instance, you need separate pick lists printed for cool store items (whose locations in your store start with “CS”), and for Dangerous drugs (whose locations in your store all start with “DD”), you would enter “CS,DD” (no quotes, each location separated by a comma) in this field. If a pick list being printed contains CS items, they will be printed separately, and the same for items with a ”DD” location. * I have received the above Narcotics. When you have written the message, click OK and you can either add another message to another form (choose another one from the drop down list) or move on to another preference. If this item is checked and you are using the mSupply cash receipts system, the outstanding customer balance will be printed at the bottom of each invoice. There are two spaces here. In one you can enter the header that you would like to appear on reports by default. The text will appear on the top left header for most reports. A common use of this space is to include your organisation name. In the other you can enter the default footer. Text you enter here will appear on the bottom centre space of each page of reports. You might use this space to include a confidentiality clause on your reports. Checking these boxes means that the printing checkbox will be checked by default when the corresponding window is opened. Note that you can still manually turned the option on or off in a window- these settings just affect the default value.